Amy has been studying and playing Irish Music since the spring of 2003. She became interested in Irish music after seeing the one and only Riverdance perform in Milwaukee at the Riverside Theatre. Jumping at the first opportunity that came her way she enrolled in her first Celtic Studies course, Beginning Tin Whistle with Sue VanDyke. As much as Amy loved whistle, and still does (don’t worry Sue! ), she couldn’t help but become mesmerized by the constant beat of Irish Trad … the bodhrán. It all began on a pizza box, really! Back in the summer of 2003 she enrolled in the Beginning Bodhrán Class taught by David Burns and Mick Dunphy through the Irish Fest Summer School; that being the class that truly inspired her to challenge herself and become serious about bodhrán playing. She’s progressed quite a bit from the old pizza box playing days. 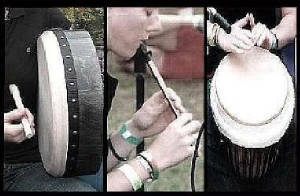 Since then she has taken bodhrán classes with Pat Roe, Brian Morrissey and Jackie Moran. Over the year's she's taken several workshops to better her playing. In the summer of 2004 Amy traveled to Ireland studying Traditional Irish Music at the University of Limerick and then has continued on with lessons/workshops through the Irish Fest School of Music, Irish Fest Summer School, Comhaltas, and Milwaukee's latest workshop program: Ceol Cois Locha. In February of '06 Amy had the honor of playing alongside John Whelan for the annual Mid-Winter Milwaukee Set Dance Weekend. To date she's played along with Irish Trad musicians/bands: Brett Lipshutz, Asher Gray & Randy Gosa (Ce), Pogue Mahone, The Patched Hats, Atlantic Wave, The Wise Maids and Ceol Cairde. Her influences include Jackie Moran, John Jo Kelly, John Whelan, Michael McGoldrick, Lunasa, Flook, Kila, Anish, Vasen, Warsaw Village Band, Danu, Solas, Comas and Gan Bua. Having graduated in May of 2005, Amy now holds a Bachelor’s Degree in Theatre and received the Celtic Studies Certificate from UW-Milwaukee. In September of 2005 she began working full time at The Milwaukee Repertory Theatre as Artistic Assistant. Not too long ago Amy finished up a semester long djembe class with Ko-Thi Dance Company and somewhere in between it all she manages to squeeze in dancing with Glencastle’s Adult Irish Dance Company, with whom she took first place in the Adult 8-hand Ceili at the 2005 Oireachtas!